My wife and I happened to catch Sullivan’s Travels on television (a wonderful movie which I’ve seen several times before—like Preston Sturges’s other movies of the early 1940s, it never gets old) and I noticed in the credits that Harry Rosenthal was billed as “The Trombenick.” Naturally, I wanted to know what that odd-sounding word meant, and thanks to Google I quickly learned that it’s a Yiddish word (usually transliterated trombenik), according to this site meaning either “lazy person, ne’er-do-well” or “boastful loudmouth, bullshitter” and according to this one “faker; bum; ne’er-do-well.” What I’m still wondering is why Rosenthal’s character is so designated; does anybody know? And of course any further information about the Yiddish word will be appreciated. “Boastful loudmouth, bullshitter” is the sense I know: etymologically, it’s a trumpet player, thus one who blows his own horn. Trumpet players may have had a reputation for laziness, too; I don’t know about that. “Тръба” is Bulgarian for “pipe” – “ъ” tends to stem from either a nasal /o/ or a hypershort /u/. To have a reflex in Yiddish (as would have taken the word from Polish, which still retains its nasals) it must come from OCS /trɔ̃ba/ – pronounced “tromba”. Therefore it seems related somehow to trumpet playing, or pipe-laying perhaps? Harkavy doesn’t list the word. 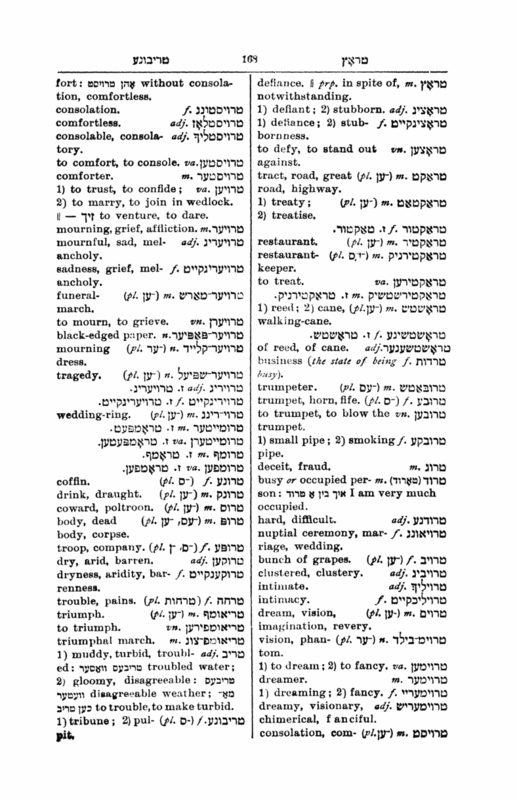 He does list trumpeter / טרובאטש /trobatch (or perhaps trubatch); trumpet, horn, fife / טרובע / trubeh; and to trumpet, to blow the trumpet / טרובען / truben. Incidentally, Polish trąbnik is recorded as meaning a trumpet maker rather than a player. Erudition thanks to R’ Ontsigndiker Google. Really belatedly, Lanmguagehat, as far as I can tell it’s an example of American Yiddish, making use of the suffix -nik, which American Jews used to append to everything that indicated a person, and the Yiddish word for trombone. It’s often used to describe a boaster, so it is, very literally, someone who is blowing their own horn. I expect this relates to fact that you can often get a donation from a Jewish person by demanding Tzedaka — charity. There was a bum in Westwood who used to come up to me and shout “Tzedaka fun Shabbos!” And so I think this is the reason: Because this sort of hobo would shout about his right to charity, like a demanding trombone. Thanks, I’m glad you found the post! That Jewish Social Service Quarterly quote is great. I’m no fan of pop Whorfianism, but it does seem significant that the words for ‘justice’ and ‘charity’ in Hebrew differ only in gender. To answer your question, I think the character was called a trombenick to distinguish himself as being outstanding among the “common” hobos. He had privileges and responsibilities that while shallow in nature, were above the limits imposed on the average prisoner. In that situation where depravity ruled, any elevation of any kind was grasped as a lifeline. This has sent me on a search for information about Jewish hobos, which produced this terrific find about the subject, written by Ralph Astrofsky in March 1928, in the Jewish Social Service Quarterly. That’s quite a read: “As in every other walk of life, the Jew has fully contributed his peculiarly characteristic subtlety, native shrewdness, and quaint dry humor to the already baffling person of the hobo, like pungent oil poured over an inextinguishable flame.” Thanks for passing it along! In “the Bowery, that Alsatian den of misery and despair,” I wonder what the sense of “Alsatian” is? Maybe a fanciful or euphemistic way of saying “German” at the time? German shepherds found themselves renamed Alsatians in Britain. “Alsatia” was a nickname for the district of Whitefriars in London, in which debtors and criminals were exempt from arrest until 1697. The ground used to belong to a Carmelite monastery which had the right of sanctuary. Even after the right was abolished by Parliament, the area remained a warren of small streets and buildings fronting on two sides, in which people were hard to find and harder to catch. The OED is silent on the etymology, but I suppose it is from the idea of Alsace as no-mans-land between France and Germany. Recent quotations are either historical or allusive. Well then, let’s not even mention the Bronx Sudetenland. Lazar: German shepherds found themselves renamed Alsatians in Britain. Perhaps as a euphemism, but also to avoid possible ambiguity with human shepherds from Germany. In French the German shepherd is known identically as le berger allemand, a word I have known since childhood. But a few years ago I was reading a story in Spanish in which I encountered un pastor alemàn and I did not immediately realize that this character was not a German clergyman. So what is the dog called in German-speaking countries? Danish and Norwegian have borrowed the short form without a second thought. though spelling it with a proper æ — or perhaps actually thinking that using a German name should be indication enough of its origin. Swedish still thinks it has to be pointed out explicitly that the beast is German, calling it tysk schäferhund. Similarly, in France the “French poodle” is simply “le caniche”, never “le caniche français”. In case anyone else is curious about the etymology of caniche, the Trésor de la langue française informatisé says “Dér. de cane*; suff. –iche*; ainsi nommé parce que cet animal va volontiers à l’eau.” And cane ‘female duck’ is derived from canard. I think it’s more common to spell it schäfer in Norwegian, in spite of æ being prescribed by the Norwegian language council. Norwegian Bokmål Wiipedia has schäferhund, no doubt reflecting dogbreeder’s terminology. Danish Wikipedia has schæferhund. LH: According to Wkipédia.fr on caniche, this water-loving dog was originally bred to hunt ducks and similar water birds. It is often shorn in various fancy ways, which originally helped it swim (probably faster than with all its hair intact). The same WWI rejection of all things German that gave us liberty-cabbage for sauerkraut in the U.S. also caused German shepherds to be called police dogs for a while, whether they worked with the police or not. When I heard of freedom fries back in 2003, I thought at once of liberty-cabbage — and so, it turns out, did the coiner of the modern expression. He also cited hot dog for frankfurter, but that was a 19C coinage. The official anglophone name of the breed is now German Shepherd Dog, abbreviated GSD, in all countries. But then again, the term for a Shih Tzu x Poodle hybrid is apparently Shitpoo, though probably not in official records. That’s a strange thing — for many dog breeds, it feels a bit abrupt to just introduce a specimen in discourse as en mops eller en Grand Danois, it’s better to call it en hund and then specify the breed later. But if the common name of the breed includes -hund, such as hyrdehund eller gårdshund, you can get away with it. Schæfer(hund) swings both ways, you would use the long form if the referent isn’t already known to be a dog, but unless you are an official of the Danish Kennel Club, the short form whenever it is. Officially, Deutscher Schäferhund — coll. Schäfer, viz. shepherd. I’ve never encountered the shortening to Schäfer, but I don’t move in dog breeder circles… OTOH, Schäferhund normally refers to the German sheepdog by default, if the name isn’t modified by another adjective or it’s otherwise clear from the context that another breed is meant. @JC: Oddly, it seems like this systematic anti-Germanism was felt more strongly (on both sides of the Atlantic) after WWI than after WWII. Salisbury steak for hamburger, too. Y: Salisbury steak is not the same thing as hamburger. A hamburger patty is all ground meat, while the meat in a Salisbury steak is only pounded to tenderize it. You have to cut that steak with a knife, unlike a hamburger. @marie-lucie: Although I am aware of the dish you are describing, I have never encountered it. I have only seen “Salisbury steak” as term for a large, bunless, possibly breaded ground beef patty. It’s a standard euphemism associated with college cafeterias. My experience is the same as Brett’s. Brett, LH: Salisbury steak : it’s a very long time since I have had one (I don’t particularly like the texture), but perhaps the definition varies according to regions. @m-l, Wikipedia seems to agree that Salisbury steak is ground meat with other stuff added — in the US at least — which can be good if the ingredients are. But bankekød it’s not. All right, whatever it is, I will NEVER order Salisbury steak again, let alone try to cook it at home. You are a wise woman. Thanks LH, it isn’t hard to be wise in this case! Make some of my meatloaf instead, y’all. m-l: I wonder if you are perhaps conflating Salisbury steak with Swiss steak, a cheap cut of steak that is rolled and pounded to tenderize it, coated with flour, and cooked with vegetable stock. 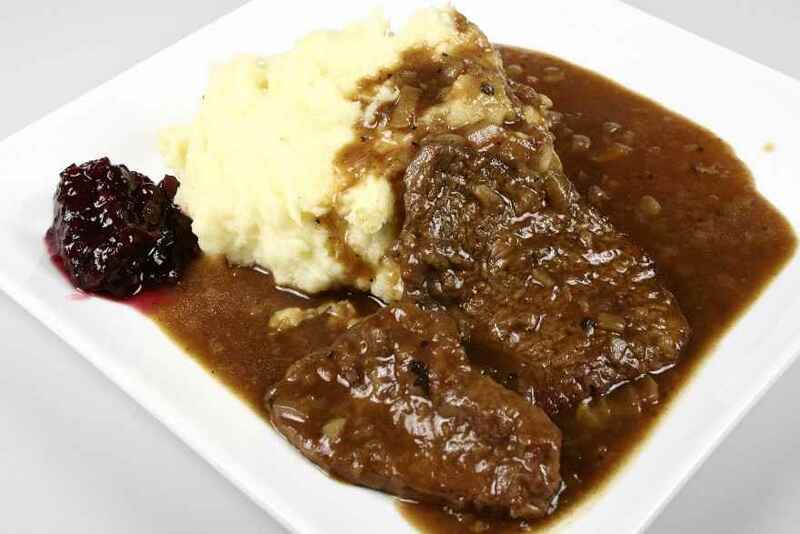 Wiktionary and Wikipedia claim that this is not < Swiss but from a verb swiss ‘roll, pound’, but no other dictionaries give an etymology for Swiss steak or list such a verb. JC: Your description of “Swiss steak” more or less corresponds to my memory of “Salisbury steak”, but I would not have confused the words “Swiss” and “Salisbury” (a word I remember from having to learn its pronunciation, which is not obvious from the spelling). Perhaps they have been confused in some places? @marie-lucie: I think you may be right, that there has been some (possibly localized) conflation of “Swiss” and “Salisbury” steaks. As I mentioned, I have heard of the pounded Salisbury steak you mentioned, from somebody complaining that the hamburger-like version wasn’t the real thing. However, until John Cowan pointed it out, I had never noticed that what he was describing was basically the same as Swiss steak, which I’ve only had a handful of times, none of which were memorable. I had actually managed to forget all about Swiss steak; this discussion has brought back vivid memories of thin, tough pieces of meat with indentations from pounding. Belongs to the era of Jello salad and pineapple rings from cans. Some of us still live in that era, either as a matter of taste or a matter of economics. There is a split in my house between those who make banana sandwiches with peanut butter (me) and those who make them with mayonnaise (everyone else). I don’t believe I have ever had a banana sandwich, nor does the idea appeal to me. I do, however, make peanut butter sandwiches with butter rather than jelly (in fact, I just had one for lunch); I’ve only run into one other person who did this. I’ve done it all my life. One of the first English chastushki I ever learned! I sometimes ate peanut butter and butter sandwiches when I was a kid, but more often peanut butter and cheese (Kraft American singles, of course). Banana on black bread is pretty good, I had that as a child. No butter needed. But banana and mayo, that’s a NO! For me the third line doesn’t rhyme: it’s “I know it sounds disgusting”.